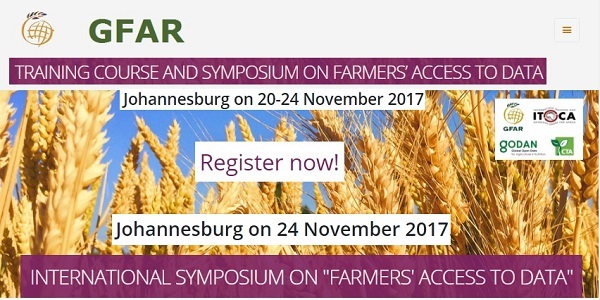 GFAR has convened a SYMPOSIUM ON FARMERS' RIGHTS TO DATA to be held in Johannesburg on 24 November 2017. Register here to participate in the Symposium ! The symposium follows a Training Course on Access to Data held in the preceding 4 days. There are still 5 slots available for participating in the training : Register here ! Issues around farmers’ rights to data, both in terms of access to data and ownership of data, are crucial to one of the key areas of activity of GFAR: the opening of access to information systems for sharing, transforming and using agricultural knowledge, especially in light of GFAR’s overall approach to putting the smallholder farmer at the centre of innovation and seeking change in their lives. During the Symposium, the panel discussions chaired by the keynote speakers will be animated by participants in the training course that will have taken place in the preceding days. Ajit Maru, Ph.D., with professional career in agricultural sector spanning almost 40 years. At the moment he is working on developing a single window platform to support small holder farmers of Gujarat, India, in their farming and participation in markets. Jeremy De Beer is a Full Professor of law at the University of Ottawa’s Faculty of Law, where he creates and shapes ideas—about technology innovation, intellectual property, and global trade and development. Dan Berne is an independent consultant working at the nexus of water, food and energy. He is an expert in standards development, business processes, market development and customer experience strategies. More information and the detailed program of the symposium will be published in the next days on the GFAR portal. The Training Course on Access to Data is targeted to farmers and farmers’ associations’ representatives as well as other actors that have an intermediary role in the farm data value chain, like extension agents, advisors and providers of farm management information systems. Case Studies of South African data tools. Questions/Discussion: What Works; what is missing? These events are co-funded by GODAN and CTA and is organized by ITOCA. P.S. "It’s Time for a Revolution in Data Access"!